Our local neighbourhood policing team have been making waves with their innovative use of Twitter- they will try an online community meeting later this month as they look at new ways of engaging with the local people they serve. Above: Cops on the tweet! Officers from the Sneinton and Dales Neighbourhood Policing Team will host the online meeting for residents to ask questions of their local officers and influence how police target their resources and set priorities in the area. 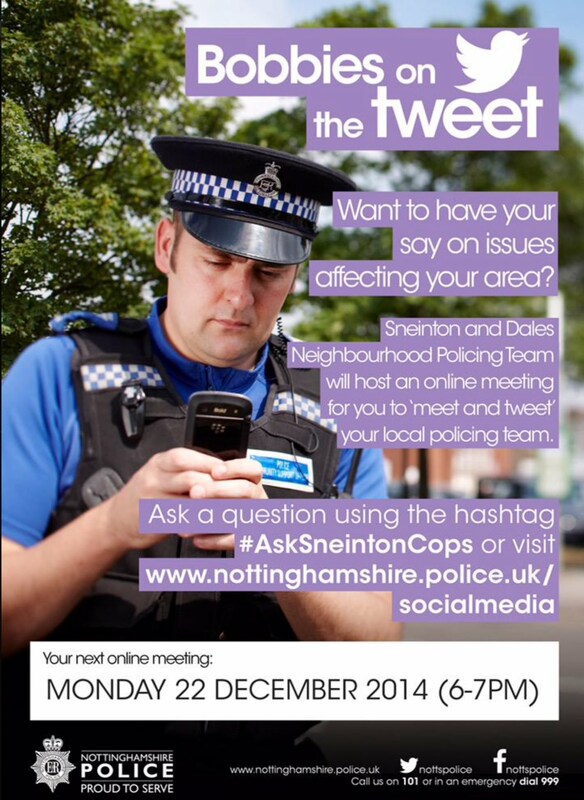 The live web chat will run on the Nottinghamshire Police website between 6pm and 7pm on Monday 22 December. Twitter users will also have the opportunity to ask questions of the team using the #AskSneintonCops hashtag. Inspector Simon Allardice from the Sneinton and Dales Neighbourhood Policing Team said: “We need to ensure that local people have every opportunity to engage with their local policing team so they can let us know what issues matter most to them. “‘Traditional’ meetings aren’t necessarily for everyone, which is why we’re committed to trying new ways of engaging with our community in a way that suits them. The online chat is the first online community meeting being trialled by the Force to complement its existing programme of street surgeries, walkabouts and more traditional community meetings. If you live in the Sneinton and Dales area and would like to take part, simply log on to www.nottinghamshire.police.uk/socialmedia between 6pm and 7pm on Monday 22 December. Alternatively, Twitter users can tweet their questions in advance and on the night using the #AskSneintonCops hashtag.